Centrally-dived One Pager with unique panel content transitions promoting the Fall Semester over at Mississippi Gulf Coast Community College. 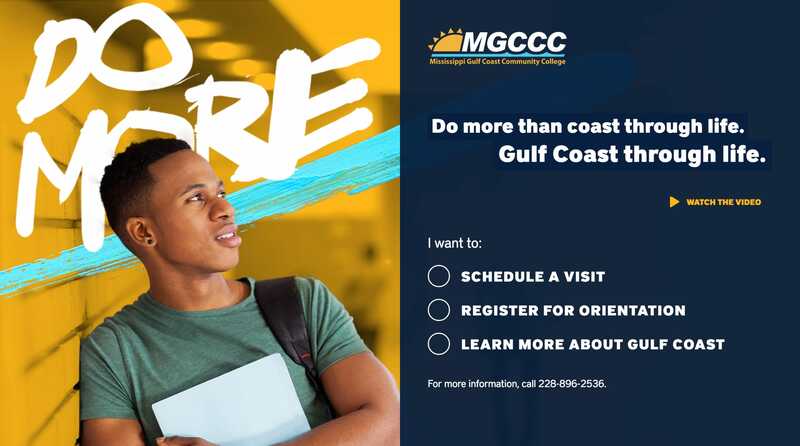 You can imagine this marketing Landing Page titled ‘Gulf Coast Through Life’ is a translation of a print campaign. Neat touch with the random intro image on load and how when selecting a calendar date, smooth scrolls to a booking form with the date selected. Cheers for the build notes! We aimed to build a Landing Page that communicates the selling points for the college, all while maintaining the simplicity necessary to support our advertising efforts. Due to the unique nature of the transition animations, we had to hijack the scroll and implement iscroll in order to retain the necessary smoothness. We wanted to Do More than just build a Landing Page with a form.